Every year at the District Convention, Key Clubbers gather to share their experiences, accomplishments, and hardships in giving back to the community. It is also an opportunity to recognize and award the precious individuals who orchestrated community events. Awards are given out to those who are diligent and true to the Key Club spirit. These individuals strive to motivate the community, propel service, and reach their full potentials. Let the Key Club community exemplify volunteerism, optimism, and ideals together through marking the milestones of its peers and celebrating in unison for the accomplishments of Key Clubbers in our District. Each club in good standing may nominate one faculty advisor with a brief 300-word summary. Each Key Club can nominate only one Kiwanis Advisor. A brief summary of 300 words (maximum) must be attached to the entry. Given to the Key Club President who has met the following criteria. Given to the Key Club Secretary who has met the following criteria. Clubs who participated in the District Service Project may apply. A completed report of your activities must be submitted with the entry. Given to the most outstanding Key Club Member in the District. Each Key Club may nominate one member from their club. Given to all Key Clubs who have shown willingness and enthusiasm in encouraging K-Family Relations. Top three Annual Club Achievement Reports from various Key Clubs will be selected to be distinguished. Clubs may submit one t-shirt entry that is to be judged at District Convention. T-shirts must comply with Key Club International's graphics standards. Clubs may submit one video entry that is approximately thirty to sixty seconds long. It must be submitted at convention via DVD or USB storage. Production cost must be under $200. Clubs may submit one entry for each non-digital and digital contest categories. Either the non-digital or the digital poster will be eligible to be submitted to Key Club International. The poster must be designed to recruit new member and should not bear the name of any school, community, or district. Each club may submit one entry in the Talent Contest in either solo or group competition. Judging is in accordance with Key Club International's standards; refer to page 50 in the guidebook. Fill in this form to apply. "Key Club International gives students the opportunity to improve the lives of others while building upon their own skills, traits, and values. 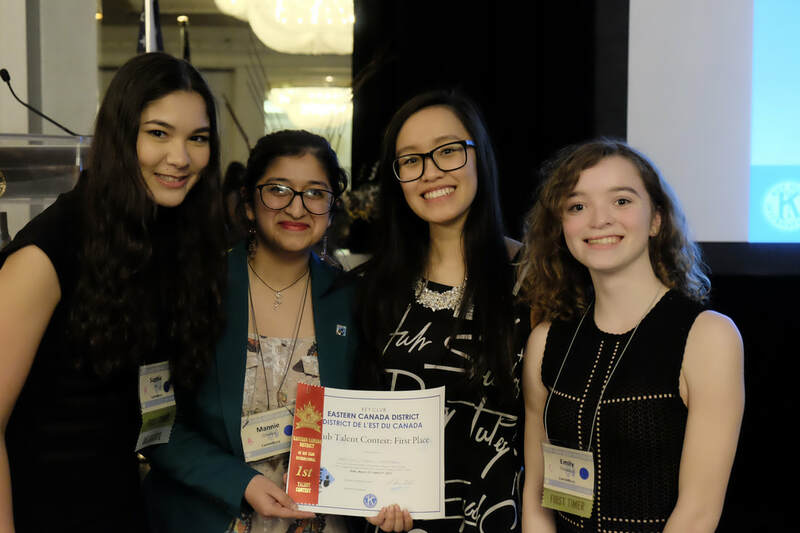 How has Key Club’s international member base, core values, and motto impacted your life, identity, and experiences as a servant leader?​"
All criteria conform with Key Club International. Each club may submit one entry for each category. This award is presented by the District Administrator at their discretion to a person who has been particularly supportive and representative of Key Club. Given to the division who displays the most spirit at District Convention. Given to the Key Club that has traveled the farthest distance to attend District Convention. Given to clubs who have completed invoice and membership roster forms and submitted membership fees on or before November 1st. Given to the first three clubs to submit their dues. Given to any club who has a net growth of five active members from the previous year (as of March 30th).